You may not have noticed it yet, but summer is just around the corner. A mere few months away. Granted, many school districts around here have added some make-up snow days, which pushed the last day of school into later June. But really, summer is near. The weather has been getting warmer. Days are getting longer. Summer vacations are just on the horizon! Does this notion fill you with joy, terror or a combination of the two? 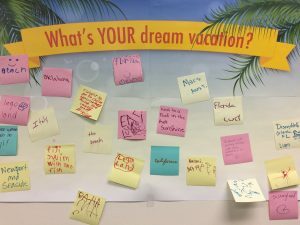 We’re focusing on the concept of planning this month, so in our waiting room, we’re asking friends to write down the location of their dream vacation on a sticky note and share it on a banner. It’s great fun to see the diverse places families would like to go. Here are a few of the dreamy locales: Mars, Lego Land, Fiji to swim with fish, Disney World, Disneyland, the Oregon Coast, Hogwarts Castle, Oklahoma, California, an over-water bungalow in Fiji, Italy, camping with family friends, and next to a pool in the hot sunshine. We love these dream vacations! While it’s pure joy just to brainstorm and dream about a trip, if you want to make it a reality, it takes more than a little bit of planning: researching how to get there, where to stay, who will come with you, what to pack, things you’ll do on your vacation, and of course, how much it will all cost. Now think of how all of this makes you feel. What are you most excited about? Is there a story around planning our summer adventures? Planning helps dreams become reality. Ask Kathleen how much planning went into her yoga trip to Mexico. Ask Rachel about the spring break adventure to Paris and the south of France she just returned from. We’ll keep our dream vacation poll going through the end of April, so let us know where your wildest dream vacation will take you! And whatever your real plans are for summer, please keep us in the loop so that we can accommodate your summer adventures, whether you’ll be heading to the coast or to Mars.